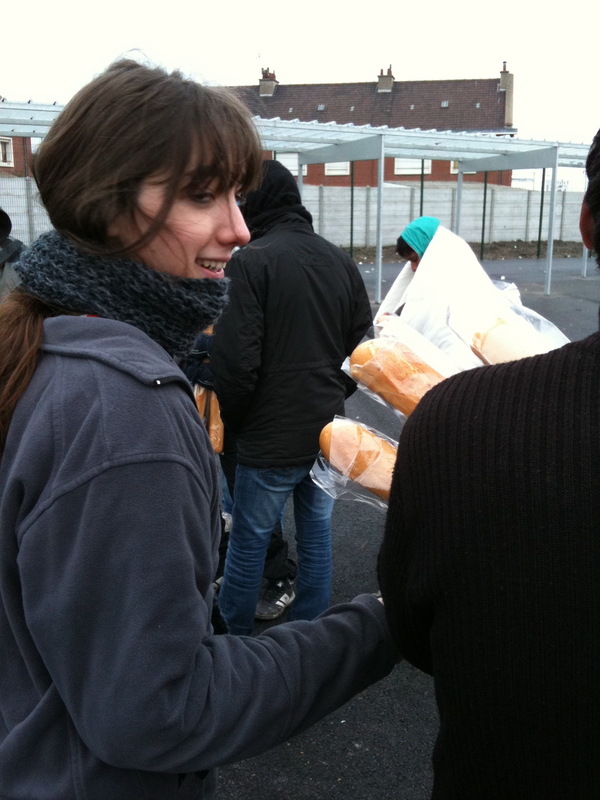 Top from left: Salam Aid worker distributes bread; the film Welcome angered the French government; migrant washes himself in cold water in Calais. 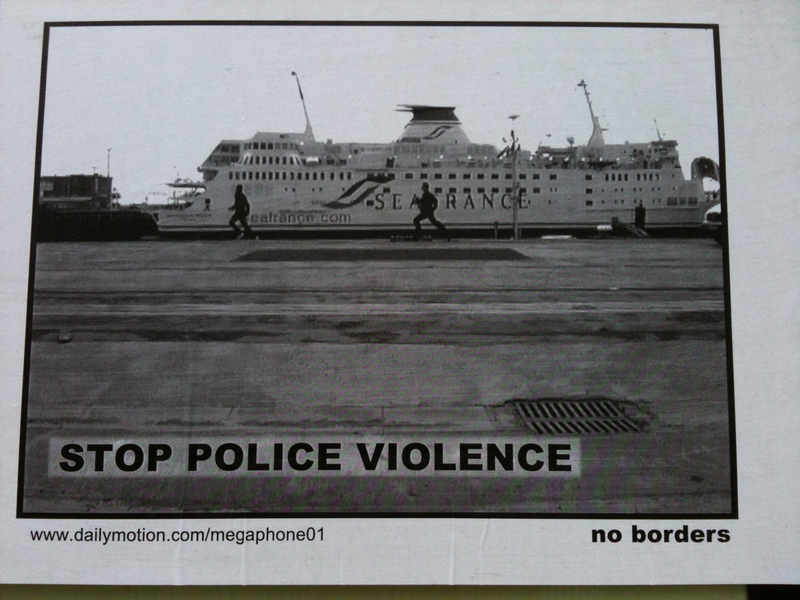 Bottom from left: British group No Borders has plastered Calais with posters, its attempt to hold a demonstration drew 500 police; migrants wait for the evening meal station to open near the Calais docks. 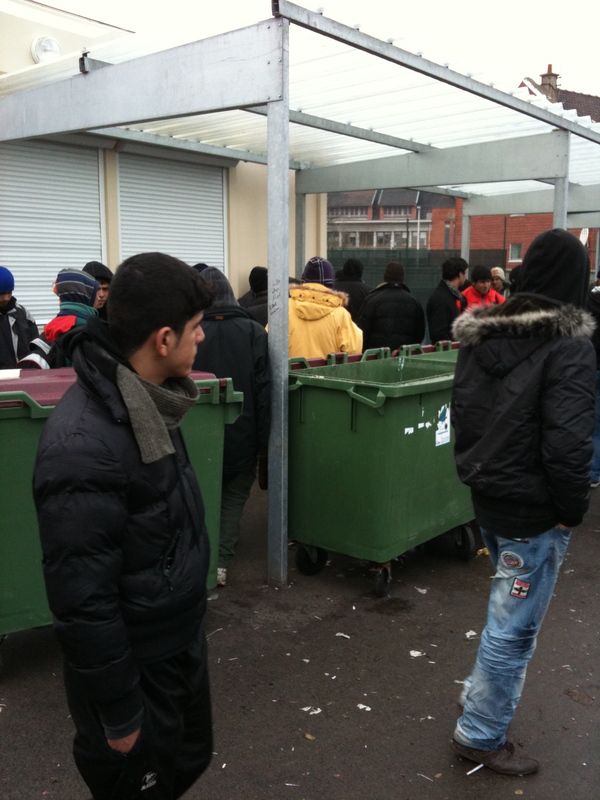 In January 2010, an extremely complex situation is revealed in Calais. It has been a cold winter and Canute-like efforts by French and British authorities to disrupt the tide of migrants do not seem to have stopped more from arriving at the channel ports, hoping to reach the promised land of Britain. The exiles come mainly from zones of conflict, mostly Afghanistan, Iraq, Somalia, Sudan and Kurdistan. The migrants are 95% male, and have an average age of about 22, although some of them are children. This is a story replete with bitter ironies. The policies of the British and French governments may not have kept the exiles at home but the officials have succeeded in making migrant lives more miserable, once they are in Calais. It might be asked from a saloon bar in the UK, why would the migrants think that Britain was a land of milk and honey? None of them will qualify for welfare. Jobs are scarce and they are forbidden to work hence forced if they can find a job into the most marginal and exploited employment. Improved security on the tunnel and around the port has made it harder to cross and the bribes more costly. There have been well-mediatised efforts to destroy and disrupt migrant camps, but now there are more of them, and smaller, as the migrants have dispersed. The migrants are now all along the coast in Bologne certainly but as far south as Caen and north into Belgium. Many have moved inland to autoroute lorry parks (‘aires’) where they attempt to find concealment among cargoes destined for Britain and others are biding their time alongside the Canal St Martin in Paris. With no legal status in France, but all the normal basic human needs , the migrants present policy dilemmas and political pressures as well as ignite defiant acts of generosity. This isa country that boasts that it is a land of welcome and asylum, yet the National Front remains a potent political force and Sarkoszy’s ruling UMP is obsessed with ‘Frenchness’. Polls do not show huge sympathy for migrants. The political and legal conflicts and problems are multiple. In France it is illegal to help illegal migrants and worst of all to provide accommodation or to host a migrant. «Toute personne qui aura, par aide directe ou indirecte, facilité l’entrée, la circulation ou le séjour irrégulier d’un étranger en France, sera punid’un emprisonnement de cinq ans et d’une amende de 30 000 euros.» (L’article L622-1 du Code de l’entrée et du séjour des étrangers). Nevertheless, there are defenses to this seemingly endlessly vague and broad law, and seeming exceptions. If anyone is breaking the law they include the socialist regional government which is subsidising relief efforts, and even the UMP mayor of Calais, who is providing a space for the migrants to receive meals. Many other organisations and individuals are also defying this law. Others are operating in shadier territory. The police have the ability to arrest anyone they like in France and hold them incommunicado in the squalid conditions of garde a vue for 48 hours, and they have used this power against selected activists in Calais. The contradictions and cruelties of the migrants of Calais are the theme of Phillipe Lioret’s Welcome (2009), a gritty example of filmaking that tells the wider story of the migrants through the tale of just one. It is not necessary to speak much French to understand the film that in any case includes numerous passages in English.Welcome was condemned by the French ‘national identity’ minister Eric Besson, a former socialist whose former colleagues believe has sold his soul to the devil to become a minister in Sarkozy’s government.It is now many months since the film was released but the conflicts in policy exposed by it remain acute. 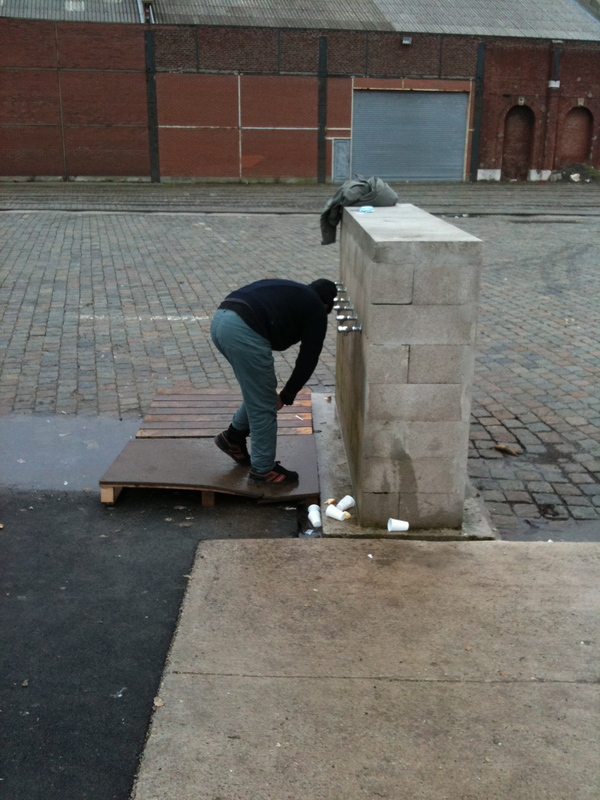 Activities by NGOs and charities working in Nord-Pas de Calais are loosely coordinated by the C’SUR (Collectif Soutien d’Urgence aux Réfugiés) coordinated by the activist priest, l’abbé Boutoille, who is a strong critic of the government’s national identity policies. CADA (Commission d’Accès aux Documents Administratifs ); No Borders – agitate for political rights of migrants; Le GISTI (Groupe d’Information et de Soutien des (Travailleurs). In Bailleul (near Lille), a hospital has accommodation available for migrants who are recovering from serious illnesses and surgeries. Although it seems that each NGO has its specific task, tensions have been mentioned (political, personality clashes, and competition to attract media attention) . Recently, British and French ministers including Besson visited an enhanced joint migrant intelligence center with headquarters at Kent Police offices in Folkstone. This includes a French officer as well as officers from the UK Border Agency and one must presume others unmentionable. The British and French also share the cost of migrant deportation flights to Afghanistan. On the French side, strong deployments of CRS and National Police and Gendarmes surveil and control migrants and sometimes arrest them. Physical mistreatment of migrants by the police has been repeatedly alleged. The French mobilised 500 police to control a street protest in the Calais area sponsored by No Borders,. There are further British support groups interested in the situation. A British lawyer is coming to Calais soon to advise migrants. NoBorders alleges police brutality towards the migrants. Migrants are themselves the victims of criminals especially of the ‘mafia’ of passeurs who promise to arrange passage to England in return for cash. There is no evidence that the police interest in the migrants has translated into prosecutions brought against these passeurs. Calais is in a fascinating and extraordinary corner of France that has inspired writers and artists from Danny Boon to Emile Zola. This is the land of the Ch’tis – influenced by Flanders, England and its position at the portal of the channel tunnel (tunnel sous la Manche) as well as a thriving ferry port. Coal and lacemaking have lost importance here but the port and tunnel are booming and Calais is a major entrepôt with millions of tons of freight passing by rail and truck to and from the UK. This is the short crossing to the UK dense with vehicles and the magnet for those seeking entry into Britain. Who these people are, what they want, where they are from, and how they got here, is not always clear. Some of them are doubtless not the people one might wish taking up residence. Others are surprisingly personable. No easy answers.